Mark Allen 'The Pistol' may face disciplinary hearing of WPSBA for his inappropiate language use in the press conference at UK Championship. Following Mark Allen's use of inappropriate language in his press conference at the williamhill.com UK Championship, he has been referred to the WPBSA's disciplinary committee as he is in breach of tournament rules and could be charged with bringing the game into disrepute. World Snooker's governing body, the WPBSA, expects its members to behave in a manner which is appropriate to their status as professional sportsmen. At a time when our sport is growing fast on a global scale and we are encouraging greater participation among young people, we expect players to be role models and take the issue of their behaviour very seriously. 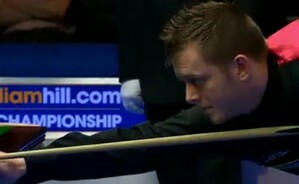 World Snooker will make no further comment until after the disciplinary hearing. Allen said on Monday: "The players don't really matter, so **** the players. "Whenever Barry came in, one of the first things he said was that the World Championships, UK and Masters wouldn't be touched. Only 18 months later, the UK format has changed. "I don't think he's pleasing too many players, but anyone who voted for him has only got themselves to blame. I wasn't one of them." "I've got no doubt he'll tweak the World Championship. Barry's just there to make money for himself, it doesn't really matter about the players. The whole tradition of the game is going to pot,"
"It's not all about bringing people in to watch and have a good time, shouting and having a drink. "He (Hearn) needs to get away from the darts factor. It's getting close to that. I think in the long run he'll probably do good for snooker, but not for my generation. It's time to let someone else have a go." The Northern Ireland player's negative comment on the revolution of the game brought by World Snooker Chairman Barry Hearn who had assumed the office last year. No doubt Allen is only one of the many players who have different view of point against Barry Hearn, however, this could not change the fact of snooker going down slope. Here is the exclusive interview that done by On Q Promotions with Allen after the release of World Snooker Statement. 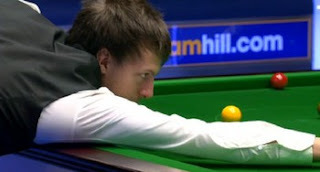 Judd Trump edged out Ronnie O'Sullivan from 4-5 behind to beat The Rocket 6-5. Ding Junhui beaten Matthew Stevens in decider as well, he is now facing Neil Robertson who beaten Graeme Dott 6-3. Judd Trump's next round opponent will be Stephen Maguire, who knocked out the defending champion John Higgins 6-4.